In a world in which sports is business, and business still includes marketing and public relations, it would make sense for an athlete to be discouraged from being open about his religious beliefs. The benefit of gaining one fan base does not, in many cases, outweigh the risk of losing another. The people who make money off athletes want those athletes to be popular; they don’t necessarily want them to be polarizing. So perhaps you can understand why, while being one of the most popular cricketers in Australia for the last five years, 29-year-old Usman Khawaja has never before spoke to the media about being a Muslim. Khawaja was born in Pakistan, but his family emigrated to Australia when he was a child. He grew into a phenom talent as a batsman in one of the Oceania region’s major sports, and in 2010 — not long after earning his university degree in aviation — became the first Muslim to represent Australia in an international cricket match. Khawaja’s comfort in his own skin is palpable. He exudes a quiet assurance that belies his relative youth. “I pray because it keeps me sane and grounded,” he says. Grounded was an interesting choice of word for a qualified pilot. Like religious observance and batting, flying is a solitary activity that demands application and sustained commitment. Khawaja attempts to meet the requirement to pray five times a day but sometimes has to forgo this to accommodate his schedule. Unlike England’s Moeen Ali, he does not pray in the team dressing room. During matches he finds the privacy of his hotel room more conducive to the mindfulness and piety that his practice demands. Nor has he felt obliged to make political statements about the plight of his co-religionists in global trouble spots, as Ali did during the Southampton Test against India in 2014. The England allrounder sparked a controversy by wearing wristbands emblazoned with “Free Gaza” and endured booing and abuse at various Eng­lish grounds later in the season. Although he does not wear a beard like Ali or Fawad Ahmed, he abstains from alcohol. Like Ahmed, he has been excused from wearing alcohol sponsorship logos on his Australian shirt. His devotions are essentially private. 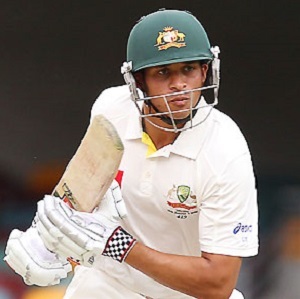 According to Khawaja, his life in Australia has been untainted by prejudice. Both cricket, especially his state and Test teammates, and the wider society have embraced him and his family. “I have not had any incidents of racial stuff. Nor has my mum, who wears the hijab,” he says. He considers Australia “a great place to live”. “Most people just get on with things,” he says. Injuries have kept Khawaja out of action enough in recent years for him to pick up a label of “injury-prone,” but when he is healthy and on the field he is still one of Australia’s best athletes. If he continues to be willing to wear his faith on his sleeve and be a positive example of a Muslim, he could also become of Australia’s best ambassadors for peace and unity.